The declaration that Bob and Roberta Smith made as part of Folkestone Triennial 2017, that FOLKESTONE IS AN ART SCHOOL, is as true now as it was then and will continue to be as long as there is creativity in the town. During six weeks throughout September and October 2018, supported by the University for the Creative Arts and the Creative Foundation, a new FOLKESTONE IS AN ART SCHOOL cohort participated in workshops led by six of Folkestone's artists and educators; Kate Beaugié, Sue Venables, Jonathan Wright, Selina Bonelli, Matt Rowe and HOP Projects. Held across various cultural venues in the town; The Grand Hotel, The Grand Burstin, The Brewery Tap UCA Project Space, Performance Space, Cube Ceramics and HOP Projects, the overarching theme of the workshop programme was the public realm and how we can respond to and explore it through a range of artistic practices. The fantastic work of this year's cohort was celebrated with the Cohort Exhibition, where the group displayed their favourite works from the programme including tonal life drawings, photographs taken inside a camera obscura, plaster casts and drawings, strange brick sculptures and an inflatable architectural structure. These workshops ran alongside a series of writing workshops led by JJ Charlesworth and a talk series bringing together artists, academics, arts educators and arts organisation directors to discuss the relationships between art, education and public space. Cohort members: Chloe Beardsley, Amy Carter, Molly Clarke, Casey Davidson, Joan Dever, Hayley Heath, Amelia Hedley, Reuben Jenkins, Rye Larson, Jodie McCarron, Cam McKenna, Adrian Pascual, Linda Shaw, Harry Smith, Alex Terry, Luke Williams. For the penultimate workshop in the programme, the cohort met up with artist Matt Rowe at Cube Ceramics. The workshop was inspired by the sculptural qualities of the old brick stock, which is revealed to us as many of the buildings in Folkestone undergo renovation. The sessions focused on experimenting with and sharing making techniques, whilst exploring the concept of how clay can be transformed from a soft malleable material into a robust ceramic brick. By using a brick mould the cohort made their very own experimental handmade bricks. 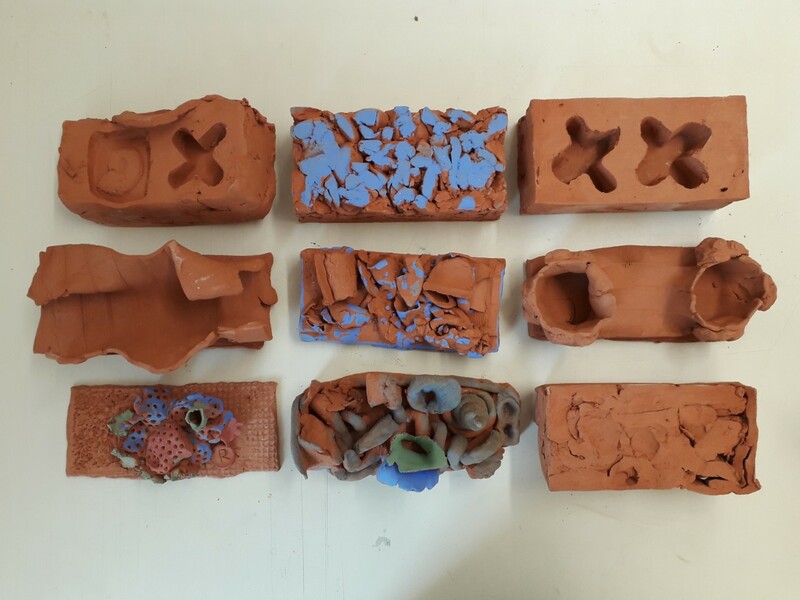 The cohort were also challenged to transform a section of old brick stock into a decorative sculpture using glaze and other forms of ceramic surface technique. By incorporating these old and new pieces together, strange and intricate assemblages were constructed; highlighting a brick's material and sculptural qualities rather than its well known functionality. The final workshop of the programme was led by HOP Projects in their gallery space on Tontine Street. After an inspiring introduction to a variety of inflatable architecture projects that have taken place across the world, the cohort worked in teams to plan and create their very own inflatable structures. Starting off by sketching and testing out their ideas on a small scale, the cohort used problem solving and trial and error to work themselves up to create a huge inflatable structure. Using a single office-style fan on a stand, the structure inflated to fill the whole gallery space. A cleverly concealed doorway enabled the cohort to get inside the structure and to add drawings to the inside of the walls. Due to the transparent material used for construction, passersby were able to view the development and final result of the curious temporary room within a room.